Often, we are contacted by organizations who need to update their look because they are going through rebranding phase in their business. Rebranding can be an excruciating process because it involves so much more than just changing out the signage – it is a process of converting everything from print to web that represents your organization. Although it is often not considered a typical business, we were recently contacted by North Atlanta Church of Christ because they were in the rebranding process for their congregation. The church faced the same dilemma that many businesses face when making the decision to rebrand – relevance. Although there are many reasons to rebrand, relevance is often one that creates a pain great enough for a business to be willing to go through the process of change. In the case of North Atlanta Church of Christ, they wanted to bring themselves up to date from the 1970’s motif that their church signs currently conveyed. The demolition of the old sign to make way for the new monument sign. Barbara Bryant from the church in Dunwoody first contacted our team at Pinnacle in late 2016 during their rebranding to start the process of updating their signage. The church had already begun their other rebranding efforts with their websites and literature. Barbara, in addition to Ken Snell and associate pastor Tim Tidwell, wanted to update their signage on everything from the exterior signs to the interior signage and church buses. However, their priority was their most visible monument sign on the road. This large sign attracted the most attention from those passing by and was currently conveying the 1970’s motif for the church. After a lot of conversation and thoughts on how to update the sign, we all concluded that the best option was to demolish the old church sign and rebuild it. In addition, it was decided to construct a second sign at the secondary sign at the north entrance of the church. The secondary sign would give those passing by the second point for wayfinding direction to the church. 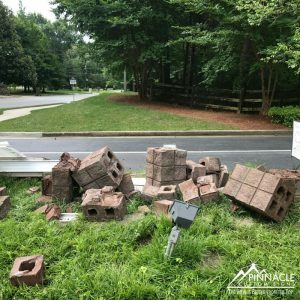 While awaiting approval from the church, our team worked with the City of Dunwoody to get the permits necessary for the installation. 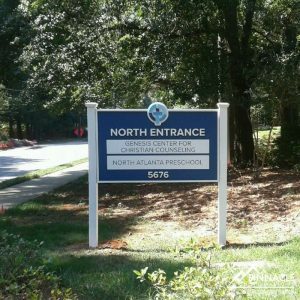 The City of Dunwoody does not allow a business or organization to have two monument signs but does allow for a secondary sign on posts. So, we created a second post and panel sign to match the entrance monument by routing a HDU sign on our CNC router and hand painting it to match the main monument. We started by installing the post and panel church sign at the secondary entrance. Before the installation for the monument could begin, we needed to demolish the original signage. Our team went out and tore the original sign down to have the stone laid for the new signage. During the interim for the signage to be rebuilt, Pinnacle installed a temporary post and panel sign to allow the church to have church signage that showed off the new brand until the new monument could be completed. After the stone work was complete, we installed the new foamcraft sign for the entrance. 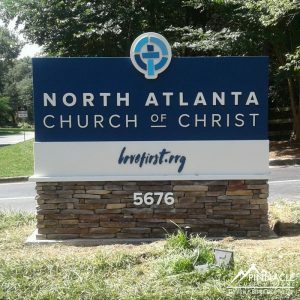 North Atlanta Church of Christ was thrilled with the final product of their outside signs and is beginning now to move toward their second phase of interior signage and bus rebranding. Although church rebranding is not something that is thought about as much as your traditional business rebranding, it is still a reality for many churches. 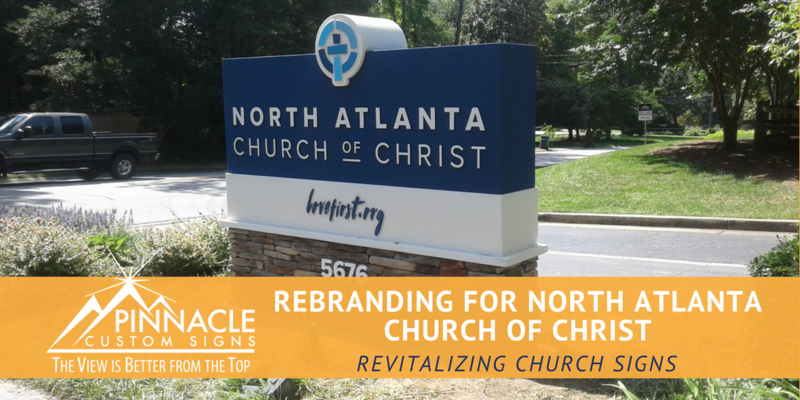 North Atlanta Church of Christ is the second church location that the Pinnacle team has assisted in rebranding. The first location was Prince of Peach Catholic Church in Flowery Branch, GA. If you are in the process of rebranding your church or any other business, give us a call for a complimentary consultation on how to change your look in the most cost effective and efficient way possible.